I’m not an artist. I’m a writer, and my passion is for words. But when I write a picture book, I know that my words can never be as important as the pictures, for creating the overall feel of the book, or even for telling the story. It is after all, a picture book, not a word book! Which means that the role of an author writing a story for a picture book is very different from the role of an author writing a novel. When I’m drafting a novel, my aim is to put pictures - of the characters, the chases, the magic, the monsters - into my readers’ heads. But when I’m drafting a picture book text, I know that the story will be brought to life by the skill of an illustrator, so my words have a different function. One of my responsibilities as a writer of picture books is to create opportunities for wonderful illustrations. When I write a picture book, I weigh up the plot not just from the point of view of the characters and the readers, but also with the aim of offering the illustrator plenty of chances to create original, magical and dramatic pictures. 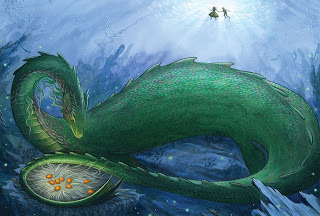 For example, when I started writing The Treasure Of The Loch Ness Monster, I wanted to give the artist scope to create as full a world for Nessie as possible. That meant not only pictures of the shores and surface of Loch Ness, but also at least one underwater scene. So I searched for plot ideas that took the characters and therefore the readers down into the depths of Loch Ness. I didn’t know what the illustrator Natasa Ilincic would draw for that scene, but I did know that I had to write a plot which gave her the chance to explore it. One of the strengths of a picture book is that it’s not just the writers’ story. A picture book (unless it is created by one of those amazingly talented people who can write AND draw) is created by two people’s imaginations. The world of a picture book is not just the writer’s world, it is the illustrator’s world too: a shared world that has been enhanced and deepened by both our imaginations. When the illustrator is someone as talented and wise and deeply immersed in folklore and history as Natasa, then the illustrations bring a huge amount to the story’s world. I love being surprised by someone else’s vision of the story. In this book, the treasure chamber that Natasa imagined under Castle Urquhart took my breath away. I’d imagined a small dark room containing not much more than the treasure necessary for the plot, but Natasa drew a huge arched chamber filled with fascinating objects from legend and history. I see something new everything I look at it! And that’s the joy of writing picture books. I knew what I needed the room to contain for the characters and the narrative, and Natasa drew that perfectly, but then she added her own magic, her own vision, and she made the story so much stronger. And that’s why the pictures are the heart of a picture book! 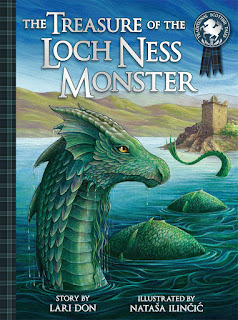 Lari Don’s most recent book is The Treasure of the Loch Ness Monster, published by Floris Books. Lari has written more than 30 books for all ages, including fantasy novels for 8 – 12s, picture books, retellings of traditional tales, a teen thriller and novellas for reluctant readers. Thanks for this, Lari - a very interesting post, and the book looks beautiful! The book does look lovely! Interesting post Lari. When I pitch a picture book to a publisher, I point out the aspects that will give an illustrator a full range of opportunity to be creative... things like texture, or movement or the change between night & day in the course of the story. And yes I want to excite the illustrator as much as possible.